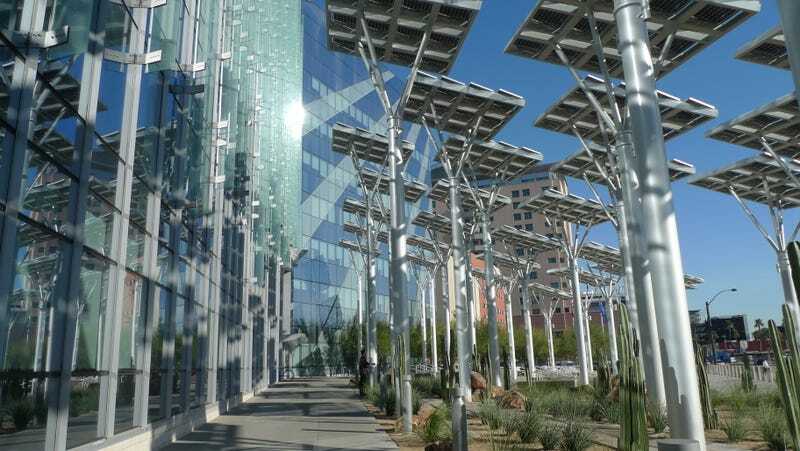 Between the Downtown Project's area and the Arts District is the new Las Vegas City Hall, a gleaming mirage of a building surrounded by a forest of photovoltaics. This is where the city leadership moved after it leased its old City Hall to Tony Hsieh's company Zappos—a move that you can't help but imbue with some heavy symbolism. From 1973 until 2012, some of the best real estate in the city—20 acres on Las Vegas Boulevard—was occupied by the former City Hall, which never made much sense, deputy city manager Scott Adams tells me at his bright, seventh-floor office in his jovial, Fred Willard-esque cadence. "That's about as close as we could get to waterfront property in Vegas," he says. "We had all this tax-exempt, government land sitting on a prime location." In 2008, in what Adams describes as a "watershed moment," the city council realized they could use that land in conjunction with the limited funds they had to bolster the emerging downtown development. "We have to give our city council a lot of credit because they made a lot of really hard decisions going into a recession, things that would drive a lot of this foot traffic that's causing the buzz downtown," he says. The first decision was to move their civic operations out and swap their prime real estate for cultural and economic uses. And the second was designating three development priorities: the Smith Center, the Mob Museum, and a new City Hall. These three projects form a triangle on the west side of downtown. The city helped the state-of-the-art performance venue Smith Center to locate to Symphony Park, an area just over the railroad tracks (which still isn't quite a park yet but is used as community event space). The Mob Museum was placed next door to the old City Hall in the historic federal courthouse (how very appropriate!). And City Hall began work on its new digs in 2010, creating a new district to the south with additional government buildings, courthouses, and a new transit center in what Adams admits was once a tough area. The city was prepared to turn the former City Hall land over to a developer for an arena. But in 2010, Andrew Donner, CEO for the developer Resort Gaming Group, told officials he wanted to buy the building and lease it to Zappos, then located in suburban Henderson. The city was incredulous. "We went out to do the tour of Zappos, and when we got done, Tony took us into a conference room and said he was serious," remembers Adams. "It was the only building in the valley that was big enough to accommodate them." After moving Zappos to downtown and putting an estimated $40 million into the building, Hsieh launched the Downtown Project, an urban revitalization project, and purchased an additional $115 million of real estate. He now controls the equivalent of eight city blocks downtown, about 26 acres. The area is now very healthy economically. Adams points to the Fremont East Entertainment District, which is ground zero for the Downtown Project development. The district was launched in 2005 as a collaboration between the city and local business owners to spruce up the street. The six-block district has now had all available land snapped up. "Our market is really good downtown, we have lowest vacancy rates in office and retail, we've got three or four developers trying to build office buildings," says Adams. But here's where it gets tricky: Usually, in growing cities, new businesses would be able to move affordably into a vacated industrial area. Vegas doesn't have those warehouses, factories, or any of that old building stock. Those vacant lots that checkerboard the landscape out Adams' south-facing window? There was never anything there. It's on the developers—and the Downtown Project—to truly start from scratch. A lack of building stock, coupled with the economic collapse, means the city also has to work exceptionally hard on housing, something that Adams says is a current hot-button priority. "When you study the history, we skipped a market segment that other cities have come to embrace," says Adams. Most cities have recently invested in mid-rise, mixed-use developments that are four to six stories. "During our white-hot years, we skipped that and went right to high-rise. The reason was, our construction costs and lands costs were so high because of what was going on on the Strip, you couldn't make it work here." There are still unfinished towers on the Strip, including an empty building that reportedly cost $1 billion. "Now construction costs have come down, land costs have come down, and now we're seeing companies say it's going to work." With the push for housing also comes a focus on public works, says Adams. "Have you seen the orange cones out there?" I admit that I've noticed an exceptional number of sidewalks under construction, and a shiny new pedestrian bridge going to Symphony Park. "We're creating a positive pedestrian experience," he says. "We're boosting our streetscape." That includes improvements like a dedicated rapid bus stop for the Arts District, where they're also helping with a museum proposal that will dramatically transform the landscape. And a network of parks—something that has never been a part of Vegas' DNA, he says. I mention that I've noticed a lot of these downtown changes rippling into casinos, with outdoor eateries and shops, better walkways, and even some greenspace to be found: There's a New York-style "park" planned for the MGM Grand, complete with a Shake Shack. This gets Adams excited. "They're learning from us!" he exclaims. "We've never been about gaming downtown, our goal was never to build a gaming center. It's always been about building a traditional downtown for residents of Las Vegas, where people can live, work and play. The Strip proves that if you get the tourists, you can't always get the locals. But we've proved that if you get the locals, you can also get the tourists." One thing the city council was roundly criticized for after that watershed moment was not using the available land to build that sports arena. But Adams says what they've achieved is better. "We've been tracking everything that's a cultural or arts facility that's come downtown in the last few years and what its attendance is—First Fridays, Life is Beautiful, Helldorado, Mob Museum, Neon Museum, Smith Center—you put them all together, it's about 1.2 million visitors," he says. "That the same as an NHL or an NBA arena. So we've created the economic impact of something like that but through a whole bunch of different things." All the activity means that downtown development is reaching a critical juncture. "One of the things we want to get going this year is a major new master plan for downtown," says Adams. That will have to happen in partnership with the Downtown Project, which might have to tighten up its loose, free-flowing strategy. "The city works in a very formal, conservative, stodgy way, and then you've got those guys who are all over the place," he adds, laughing. "We've got no clue what their plan is. I'm not even sure what they're doing is according to a plan, anyway." "But it's worked," says Adams, with a big smile. "We're working together really well." It makes sense now why the Downtown Project has so much civic support: It is an extension of what the city was working towards already. In a way, it's functioning like an arm of the government, a high-level development agency, maybe. But Adams offers another way to think about it. "Tony's almost like a foundation," he says, thoughtfully. "If you think about it, other major cities have been built by foundations. Indianapolis comes to mind—they became a sports capital on the backs of the Lilly Foundation. It's like Tony's a foundation and he's investing in the community like a foundation would. That's helped us develop much faster." We're reporting live from Las Vegas on the Downtown Project, the $350 million urban revitalization project launched by Zappos CEO Tony Hsieh. Read all our coverage here.